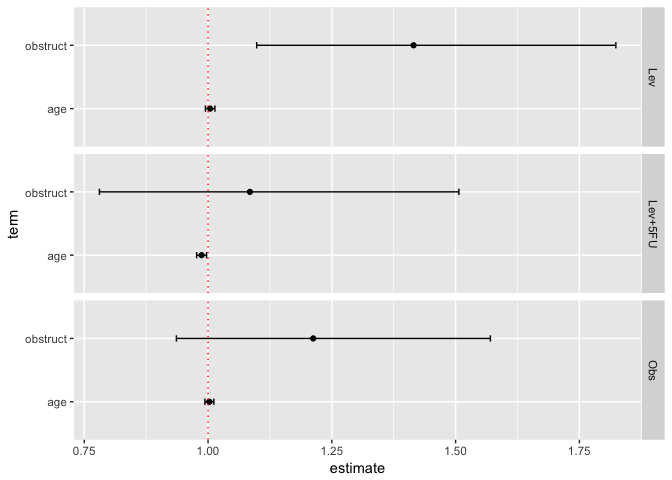 get_cox_res: Run univariate or multivariate cox regression. iter_get_cox_res: Wrapper over get_cox_res to faciliate ease of multiple get_cox_res runs. Internally, this makes use of purrr:map to iterate over a list of features. 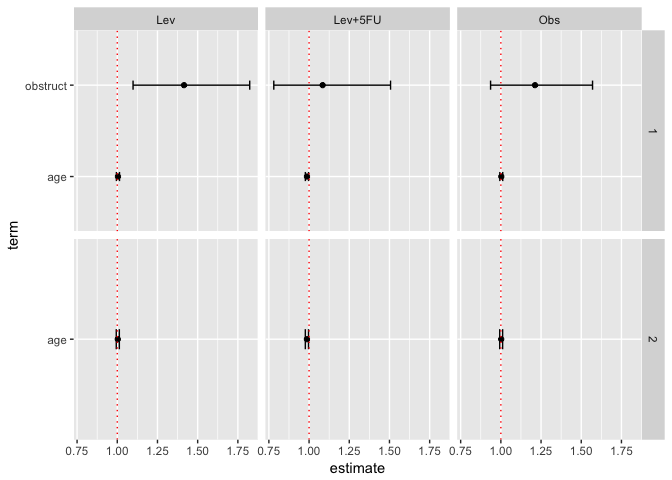 plot_cox_res: Generates a forest plot of the univariate or multivariate cox regression results from get_cox_res. get_surv_prob: Calculates the survival probability at specified times from a survival curve. get_nrisk_tbl: Provides a number at risk table as typically seen in publications. get_logrank_res: Runs a log-rank test. age and obstruct: These are the features we want to regress on. status: Event status (1 for event; 0 for non-event). 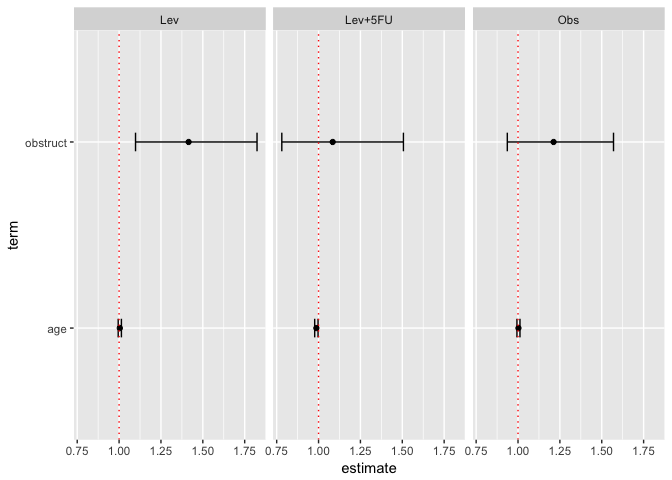 This gives us a forest plot with the hazard ratio and confidence evidence for each feature. 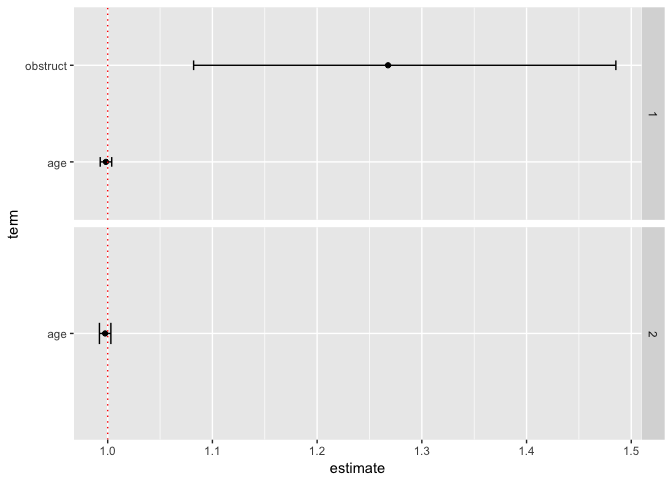 If we are interested in running cox regression within each treatment group, we can make use of the group parameter. 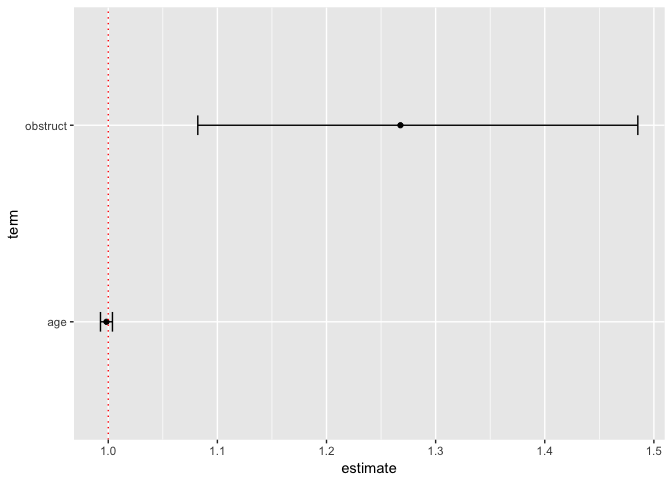 This will facet the groups (per column) so that we can visualize the cox regression results for each treatment group. The formula is the format for ggplot2::facet_grid with the full documentation listed here. In short, the left hand side of the formula indicates what you want to facet by row. The right hand side of the formula indicates what you want to facet by column. By specifically . ~ group, we are indicating we do not want to facet by row (this is indicated by the .) and we want to facet the group variable by column. One useful function is the iter_get_cox_res which allows you to easily run the get_cox_res function multiple times without needing to setup a for loop yourself. 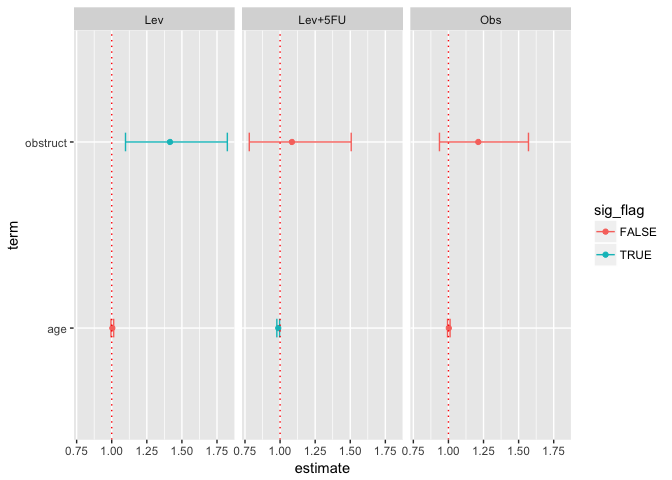 This is useful in situations where you might need to perform multiple pairwise multivariate Cox regression analysis to test the independence of a novel prognostic biomarker to existing biomarkers. By default, all features will appear in each facet. The facet.scales parameter drops features on the y-axes that are not part of the specific Cox regression. Latest version of broom (0.5.0) returns tibbles now. As the get_cox_res function uses broom, the results were now being returned as tibbles. The test_get_cox_res.R uses expect_equal to test whether two data frames are equivalent, but this does not work for tibbles. This patch changes it such that the test first converts the tibbles to data frames to allow expect_equal to work.